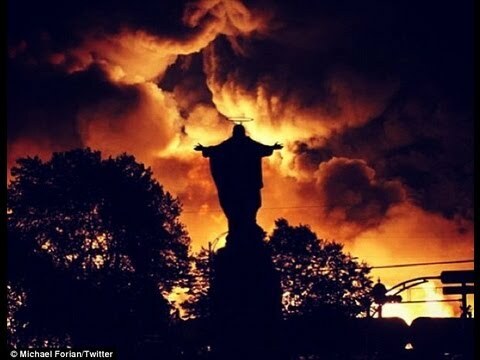 In a desperate bid to convey its apocalyptic nature, an oil train explodes in front of Jesus. This is a new blog dedicated to analysis of how and why our world is rapidly losing the ability to sustain life; to strategies for intervening; and to assessing the nature and meaning of intervention as loss and inevitability accumulate. In September 2017, with millions fleeing and sheltering from storms in the east, and with smoke and ash choking multiple major cities in the west, I wrote a widely shared note (archived as “No Third Path” on Shut It Down). It was an unvarnished acknowledgment of the severity of our situation, combined with an appeal for general engagement on climate issues. It wasn’t anything that hadn’t been said before–I think it was shared for the simple reason that it was as honest as possible without succumbing to fatalism. Now, October 2017, with storms still raging in the east and with people dying from infrastructural collapse caused by the previous ones, with fire not only raining ash down on cities in the west, but now entering them to level neighborhoods and take lives, I am making this new blog, with the intention of continuing to speak honestly and without succumbing to fatalism. Almost everyone I know who is fully engaged in trying to craft a pragmatic climate strategy that is grounded in both geophysical and political realities, is prepared for, and driven by the climate change impacts we see unfolding around us, and aims for the truly transformational, does so on the cheap, sleeping on other people’s couches, dependent on the kindness of friends for meals and to cover mobile phone charges. If any of it sounds hyperbolic, note he’d recently paid my phone bill, which allowed me to keep organizing a direct action training camp and disseminating knowledge about coal and oil train blockades, and the generosity was considerable because he, having recently participated in the coordinated shutdown of all tar major tar sands pipelines into the United States, is unemployed. A massive disparity in resources has favored some voices addressing the violation of ecological limits over others. For instance, I wrote an article for the Earth First! Journal in 2015 in which I described the need for direct action collectives to critique institutional climate policy and advance explicit alternatives. In an effort to live up to my own advice, I wrote a handful of documents like this one, which appeared on the Portland Rising Tide page, and this one, which I used as a basis for a PRT skit in which personifications of Magic and Apathy described their respective roles in Oregon’s vague semblance of a state-level climate strategy. But I still haven’t gotten to release the major report I’ve been planning on writing this whole time, tentatively and gleefully titled “A Few Modest Proposals For Reducing Greenhouse Gas Emissions On North America’s West Coast,” because I’ve yet to find the convergence of a functional internet connection, housing, and a couple months. We—that is to say, U.S. environmentalist and most climate activists—ignored the political and existential threat of the evangelical/alt-right and its fossil fuel financial and political base. We deliberately downplayed the ghastly future of climate impacts, stepping aside while climate scientists tried to take the lead role in communicating climate risk. We chose to accentuate the positive and assumed that elite forces acting behind the scenes would act decisively, and privately, in the global interest. The nature of the problem isn’t difficult to articulate, or even intuit: Environmental organizations actively work to speak in terms economic and political powers find amenable, which is to attempt the quasi-mystical act of speaking about crisis without becoming disruptive. Environmental professionals talk ruefully about sources of public cognitive dissonance on environmental issues without ever stumbling upon these decisive variables: their own mediocre language, congenial outlook, and cautious agenda. This state of affairs only worsens with the intervention of communications experts. To make an example of a climate communications document that is both already somewhat notorious and generally characteristic of the mainstream approach, in 2009, when hopes of international climate accords in Copenhagen and comprehensive cap and trade legislation in Washington, DC were soaring, a group of consultants released a report called Climate and Energy Truths: Our Common Future. The report purported to instruct environmental organizations, beleaguered by countercultural associations and cryptic scientific frameworks, on how to get people to care that everybody and everything is doomed on our current path. It got ridiculed in the right wing press, critiqued in a New York Times piece called “Seeking to Save the Planet, With a Thesaurus” and halfheartedly defended by George Lakoff. The report begins with some climate framing difficulty essentials, cites some research which shows people don’t care very much about environmental issues, and then offers a strategy past these twin burdens: stop trying to get people to feel anything about the world burning, and instead disguise your cause as something else, for instance a quixotic form of nationalism. Don’t talk about climate. No doom and gloom. Instead, lead with energy independence. Talk about limitless clean energy. Talk about reducing dependence on foreign oil. Talk about jobs. Most importantly, talk about how America needs to lead, and America isn’t leading on renewable energy. This strategy is perfectly reasonable if we are trying to deceive people into acting against their interest, by disguising our issue within a web of more congenial proxy issues. It is less reasonable if we are trying to speak past cultural and political barriers to communicate to people about what they legitimately care about the most, like survival. The social sciences are full of research which tells us what we all recognize from experience: people think in groups, and so an attitude about a given issue can predict attitudes about other unrelated issues. Abortion predicts gun control predicts gay marriage predicts climate change. Papers in the cultural cognition framework, for instance, routinely produce statistical correlations of this variety, arguing that the cultural schism underlying these polarized positions is a schism in perspective on “group” and “hierarchy.” One can readily envisage an extension of these methods: haircut predicts perspective on gay marriage, choice of beer predicts perspective on climate change. The work of communicating about climate change is the work of believing that, in spite of the vast chasms of language and culture and values that divide us, we are talking about something that legitimately is of the most fundamental possible concern to our fellow humans. We can be who we are, and be different from others, and still have something to tell them. I am listening to Estonian classical music as I write this and have many tattoos. These things separate me from others. I also want a world that continues to have gardens, baby showers, and breakfast burritos. These things join me to others, and it is this common ground I address in speaking to them. Ostensible climate framing experts will talk at length about not using culturally coded, “elitist” terminology, but it is terminal elitism, of the ubiquitously despised variety, to be disingenuous in how we talk to people about their children dying and Nebraska no longer being able to produce corn. A pivotal instance of attempting to communicate beyond cultural-political barriers about climate change will occur in rural Clearwater County, Minnesota, where a judge has recently ruled allowing people from Shut It Down–Climate Direct Action, who stopped the flow of tar sands pipelines into the US by turning pipeline emergency valves, to argue the necessity defense in court. There will likely be few people in the Clearwater County jury pool receptive to a heavily culturally coded message about climate change. There will likely be many who feel deep hostility, at the outset, to a tactical maneuver against an oil pipeline. The prosecutor in Michael Foster’s trial, in which he received multiple felony convictions–he shut down the Keystone pipeline in North Dakota while Annette Klapstein and Emily Johnston turned off two Enbridge lines in Minnesota–talked about 9/11 to the jury. The defendants will have to speak beyond some very significant cultural barriers to shared human experience. Facts alone won’t be sufficient. Peer-reviewed journals are full of research describing the numberless mechanisms people employ to disregard them. Elizabeth Kolbert recently published an article in the New Yorker called “Why Facts Don’t Change Our Minds“, and while many will be familiar with the research she cites, her title is perhaps the most elegant and direct phrasing of the phenomenon it describes to date. A deluge of facts about catastrophe does nothing to instill in most people any bodily, experiential sense of catastrophe. A deluge of water might do better. Or a deluge of California wildfire images the mainstream news is calling apocalyptic, because there really isn’t anything else to call them, consisting as they do of dead horses, melted cars, neighborhoods reduced to ash and rubble, and Mickey Mouse’s face hovering on a ferris wheel in front of a haze of smoke glowing an ominous reddish-orange. Public concern for climate does vary with extreme weather, and the ubiquity of catastrophe presumably influenced the judge to acknowledge that absolutely no one ostensibly in charge is going to do anything to stop this, and that people who want a survivable world may have no other options than to simply go and shut down the apparatus of their destruction. Ecological decline and human behavior are conjoined, mutually informed phenomena. The notion that we may meaningfully alter course at this late hour, quixotic as it may be, is essentially the notion that the earth will start breaking in ways that people find palpable and alarming, that they feel the crisis in their bodies in ways science does not make them feel, before all the thresholds are crossed. No scientist can predict our climate/ecological trajectory with great precision, but many would likely acknowledge that if such a window existed, it would be brief–probably exceedingly so. While I have sworn an oath as part of my job to uphold the law, I am certainly mindful of the importance over the course of the history of our country of civil disobedience, protest and other forms of drawing attention to crises that are happening in our world, and if there ever were a crisis right now certainly climate change is the most serious … I think it’s because of actions by parties such as yourself that change can come about. Blockading a coal train or turning off a tar sands pipeline are acts which have an intuitive communicative value directly in opposition to everything the experts have told us about climate communication. Facts don’t change people’s minds, but other people acting as if those facts were true changes people’s minds. The existence of the tar sands valve turners and the coal train blockaders fulfill an essential criterion for people’s conception of an epochal crisis. If the operations of the fossil fuel industry were truly going to eliminate most beauty and life and meaningful endeavor from the world, wouldn’t someone, no matter how daunting the task or dire the consequence, simply try to stop them? The advice of communications experts, to act normal even if the world is ending, to speak in terms amenable to people’s institutional and economic priorities even if said institutions and economies are antithetical to survival, has only created a sense of unreality. The disparity between physical reality and the behavior of those whose professional mandate is to respond to it is so vast, we can hardly be surprised the decades in which climate science has gotten progressively more horrifying are decades in which public support for strong climate action has declined. Trapped in the paradigm that it is never a good idea to tell people their lives require radical transformation, we can spend from now to oblivion writing papers on the best way to communicate a confidence interval. Or we can be honest. We can say, essentially: we are on the adventure that comes after living in this world we’ve always known together, because that world is going away. We are giving up things we would’ve held onto in that world for the obscure hope that the new world will be survivable by at least some. Join us on this adventure–go stand on top of a mountain or bury a precious object in the desert or whatever else it is you do to reckon with such things, because the ocean is raging and riot police are beating up Aztec dancers blockading pipelines in North Dakota and Mickey Mouse’s smiling visage is far more visible through the glowing red haze of the southern California sky than the sun, and this is all going to get far weirder and vaster than anyone’s mythology has prepared them to imagine. We could arguably learn a lot more about communications from ecstatic cults that have emerged in times of plague, from the dancing epidemics that mysteriously took people out of their normal routines and into the streets to dance, in some cases to death, in Medieval Europe, from Antarctic explorers who kept their crews alive in chronically life-threatening conditions, and a host of other people who chose to acknowledge the end of an existing pattern and embrace a new adventure, than we can from experts. In 1980, Earth First! emerged out of frustration on the part of career environmentalists with the tepidity and collusion characteristic of their organizations. We need a similar rupture now, but instead of a small cadre of professionals forming a new impoverished grassroots, we need everyone, and everything they bring. It is time for a mass exodus of money and popular support from major environmental organizations, who by any conceivable biophysical metric have pursued a decisively failed strategy. Fossil Fuel Resistance Network is devoted to action, to advancing tactical knowledge, critiquing institutional politics, advancing truly transformative strategies, and communicating about crisis. The mandate of communicating about crisis will be pursued with a sincere belief that there is inherent value in speaking the truth and in keeping our eyes open, whatever the chances it catalyzes social transformation; that there is a deep need for communication that is not heavily culturally coded, but is not diminished by transparently shallow attempts at cultural assimilation; that we must continue to be pragmatic, while acknowledging the overtly mythical dimension of what is happening on earth right now. Fossil Fuel Resistance Network will explicitly articulate strategies to mitigate this crisis, institutional and popular mechanisms for achieving them, and tactics that people are using toward their ends where institutions have failed.